Four young Shore Dotterel have been released on Motupatu Island at New Zealand's Pūkaha National Wildlife Centre. The species is Critically Endangered, with some 250 birds estimated to be left in the world. The centre is hoping to release more juveniles in the coming weeks, with 21 set to enter the wild on 25 March – combined with the four birds already released, this accounts for roughly 10 per cent of the global population. Only 250 Shore Dotterel remain, rendering the wader Critically Endangered (Matt Jones). Shore Dotterel – also known as Shore Plover – is endemic to New Zealand, and the recent releases provide a boost for one of the world's rarest shorebirds. The success comes following six juveniles from five pairs being released on Waikawa Island last year. 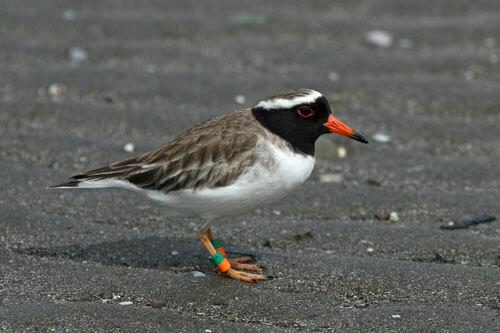 All of the breeding projects fall under the work of The Shore Plover Recovery Programme, which began at Pūkaha in the early 1980s. Mireille Hicks, Lead Shore Plover Ranger at Pūkaha, said: "This season has been very full-on. Together with the Isaac Conservation and Wildlife Trust this would be our most successful year yet; between us we have so far raised 46 Shore Plover chicks – and there are more on the way! We have seven breeding pairs in total, two of which are breeding in their first season, which was incredible. "We also have a breeding pair that was very unexpected, as the male had an injured wing and the female had an issue with her feathers. Due to these injuries they could not be released into the wild but by breeding in captivity they are actually contributing to the survival of their species. "Shore Plover is a very special bird because it's naturally very curious, but it nests on the ground and is very small – it almost 'shakes hands' with predators! They are also very nervous birds and can be easily frightened away from their nests. Many people do not know about how critical the situation is, which is something we'd like to change. Each bird is precious."